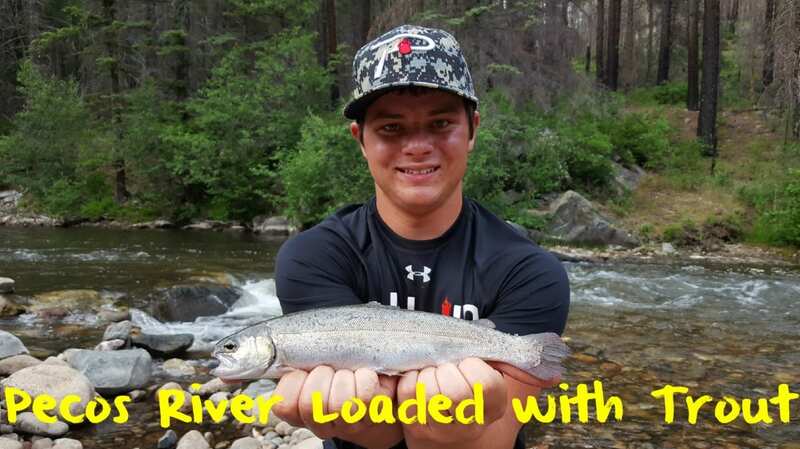 Late summer and fall spells opportunity for trout anglers in New Mexico. Water levels have fallen to attractive levels, crowds are slightly lighter as many anglers are hunting and trout are more aggressive as cooler water temperatures have prevailed. In all, it’s an excellent time to trout fish, particularly on the Pecos River where months of heavy stocking by New Mexico Game & Fish is keeping action good. We were here yesterday and encountered favorable flows and water that was much easier to fish than when we filmed Pautzke Outdoors on this same system back in the spring (twice). As they always do, high flows have been replaced by slower moving runs and pools, all which are packed with rainbows and smaller browns. The entire stretch of river from Pecos to the end of the road has plenty of trout and will continue to for the rest of fall. Anglers can expect three classes of fish. Last time we targeted trout we caught a few dozen browns that ranged from six to 12 inches, fresh planters from eight to 10 inches and those always sought after larger rainbows that average 15-22 inches. The bigger trout are harder to come by, but are available. You’ll likely have to sort through a ton of fresh planters before tying into a bigger one. There’s no best area to fish. This time of year (following great trout stocking by NMG&F) the entire river is loaded, even with hundreds of anglers taking their limits daily on the weekends and dozens during the week. We caught and released every thing, but there’s nothing wrong with keeping rainbows. This is a well-stocked, put-and-take fishery that’s no secret to anyone. Anglers will find trout everywhere. This includes well-signed campgrounds, picnic areas, roadside pullouts and anywhere else public access is available. All our trout were caught on the new Pautzke Fire Balls. And while New Mexico anglers have called Green Label and Premium (Red Top) salmon eggs Fire Balls for decades these are a new product that you’ve likely seen in some of our Pautzke Outdoors episodes. We only used the Red and Red with Glitter Fire Balls and caught as many, if not more trout, on them than we did previously on the real salmon eggs. If you’re coming this week or anytime this fall be sure to use light line. The slower flows have water clear. Even stocked trout can be spooked by anything heavier than four-pound test. Because of the seasonal flows we also only used one Fire Ball at a time on an Eagle Claw size 10 or 12 single salmon egg hook. Editor’s Note: Pautzke new Red & Red with Glitter Fire Balls are available exclusively at Walmart in New Mexico. They are also available online (all 11 styles) at FishUSA.com https://www.fishusa.com/product/Pautzke-Fire-Balls.